This is my big healthy girl, Sage. 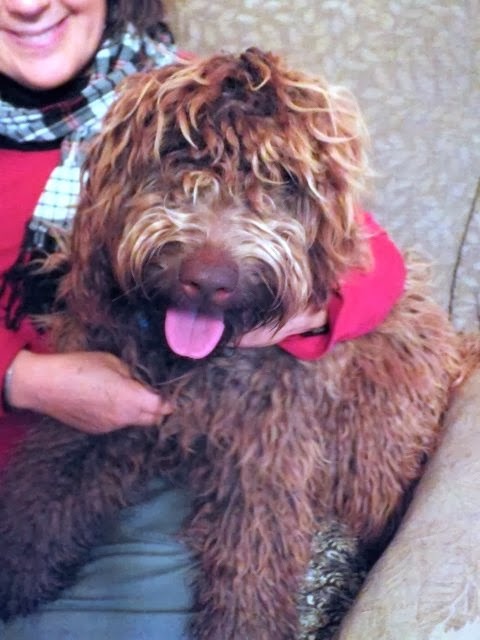 We love her shaggy look but as you can see she is almost ready for a visit to her groomer. When you have a beautiful shaggy dog like Sage, or me for that matter, you will have a harder time finding lumps, bumps, small creatures or even hidden bald spots on your big puppy. It has been my groomer who has discovered lumps on my friend, Annabel which at that time turned out to be treatable but cancerous growths. This gave Annabel the gift of another happy two years of running around the fields at home. The growths were in an odd spot and no amount of petting or even brushing disclosed them. I had a friend who had nasty little mites which made a bald patch on his head. He had so much glorious coat that nobody noticed until the groomer discovered the problem and his family trotted him off to the vet. If you are your puppy's groomer you will be using clippers and combing and brushing fur carefully right to the skin. You are being your own veterinary assistant because other than a hairdresser that is in fact what your groomer can be. We don't usually have veterinary check ups every couple of months but if we go to the groomer that frequently problems won't go unnoticed. Our annual vaccine is a time when the doctor can do much more than simple poke us in the rear end with a nasty looking needle. Our doctor brings out her stethoscope and listens to our heart, looks in our eyes and feels about to see what is what inside us. Even if you don't have vaccines every single year it is a very good idea to go to the vet for a check up. We doggies don't say much and if we are just a little out of sorts sometimes you won't know. This why a little assistance from a professional assistant is such a good thing.